Want privacy? There’s no place where you are assured more privacy than Brigand Hill. It is surrounded by 500 acres of tropical plantation splendor. Every room in the villa is private. No expense was spared on this St. Lucia villa. Every room offers huge views. The villa itself is part of St. Lucia’s history and on it lies the Brigand Cave, which dates back two centuries. There is a sunken ship off the private beach and some of the best scuba diving on the entire island. The villa is ideal for two couples or one couple who wants to make the most of a romantic getaway. You literally won’t find anything else like it in the Caribbean. 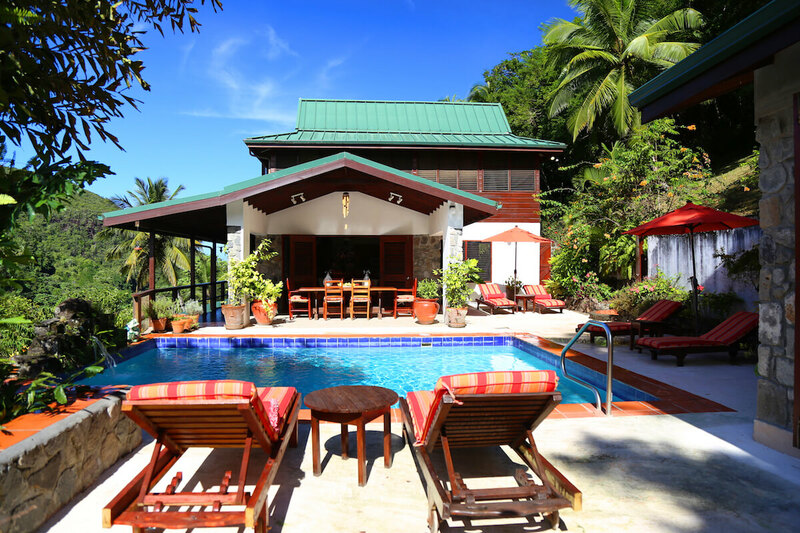 Brigand Hill, a 5000-square-foot five-bedroom villa, is conveniently located midway between the capital city of Castries (most resort hotels are located immediately north of Castries) and Soufriere to the south (site of additional resort properties and points of interest). Built by Wayne Brown, the island’s most respected designer-builder of high-end second homes, no expense has been spared to create a unique and memorable experience for our guests. No other St. Lucia villa offers Brigand Hill’s complete privacy amid almost 500 acres of tropical splendor. The late George Poindexter built the original villa in 1964. The present owners, guests at the house since the early ‘70s, bought the property and completely rebuilt it from a new design (by J. Andrew Carr of Essex, CT) on the old footings, adding a second floor master suite, enlarged caretaker’s quarters, along with many other features. The main house includes three bedrooms, each with private bath, the dining and living rooms and kitchen, and a two-bedroom cabana, with shared bathroom. Privacy is assured regardless of where you are in the villa. The bathrooms feature tile mosaics of the St. Lucian parrot, St. Lucian whip-tailed lizard, and the leatherback turtle. All rooms feature overhead fans and Jalousie windows and doors that are designed to open up each room, allowing the trade winds to flow through the house. Tastefully decorated with furniture crafted on the Island, complemented by imported fabrics and 450-count linens, three bedrooms have queen-size beds; the other two feature twin beds. Each bedroom offers terrific views. The kitchen is fully equipped and the living areas have stereo hi-fi (tape and CD; be sure to bring your favorite recordings). The patio area includes the pool, tiled terraces, extensive plantings, outdoor showers, and stairs to the garden below. Brigand Hill is named for the Brigands, the valiant indigenous people who took to the forest and waged guerilla war against the British in the late 18th Century (at the same time America was fighting the Revolutionary War), successfully retaking the island and holding it for several months. The villa is situated within the five hundred-acre St. Lucia Estates plantation. The estate grounds encompass the Brigand Cave (a Brigand headquarters two centuries ago), a wide variety of flora and fauna, a private beach (offshore is the sunken ship “Lesleen,” and some of the best scuba diving on the island), even the original plantation housing and machinery. Occupying arguably the best site on the estate, each room of Brigand Hill offers views of the mountainous rainforest to the east, the Caribbean Sea to the West, or the plantation floor below. Brigand Hill is fully staffed (cook/maid, gardener/caretaker) and the perfect place to embrace the romance and elegance of the real Caribbean. Mid way between St. Lucia's capital, Castries, and Soufriere.